This publication summarizes the evolution of the internal plumbing of Kīlauea Volcano on the Island of Hawaiʻi from the first documented eruption in 1790 to the explosive eruption of March 2008 in Halemaʻumaʻu Crater. For the period before the founding of the Hawaiian Volcano Observatory in 1912, we rely on written observations of eruptive activity, earthquake swarms, and periodic draining of magma from the lava lake present in Kīlauea Caldera. After 1912 the written observations are supplemented by continuous measurement of tilting of the ground at Kīlauea’s summit and by a continuous instrumental record of earthquakes, both measurements made during 1912–56 by a single pendulum seismometer housed on the northeast edge of Kīlauea’s summit. Interpretations become more robust following the installation of seismic and deformation networks in the 1960s. A major advance in the 1990s was the ability to continuously record and telemeter ground deformation to allow its precise correlation with seismic activity before and after eruptions, intrusions, and large earthquakes. We interpret specific events in Kīlauea’s 200- year written history as steps in a broad transition from summit lava-lake activity in Kīlauea Caldera to shield building on the east rift zone. The ability of the magmatic plumbing to deliver magma to eruption is critical to the history of eruption and intrusion. When the rate of magma supply equals the rate of eruption, there is little ground deformation or intrusion. When the magma supply rate is greater than the rate of eruption, then the edifice responds through any or all of summit inflation, intrusion, increased spreading rate, and large flank earthquakes. In Kīlauea’s 200-year history we identify three regions of the volcano in which magma is stored and supplied from below. Source 1 is at 1-km depth or less beneath Kīlauea’s summit and fed Kīlauea’s summit lava lakes throughout most of the 19th century and again from 1907 to 1924. Source 1 was used up in the series of small Halemaʻumaʻu eruptions following the end of lava-lake activity in the summit collapse of 1924. Source 2 is the magma reservoir at a depth of 2–6 km beneath Kīlauea’s summit that has been imaged by seismic and deformation measurements beginning in the 1960s. This source was first identified in the summit collapses of 1922 and 1924. Source 3 is a diffuse volume of magma-permeated rock between 5 and 11 km depth beneath the east rift zone and above the near-horizontal decollement at the base of the Kīlauea edifice. Magma distribution within source 2 has been derived by combining petrologic study of the three chemically uniform summit eruptions of 1952, 1961, and 1967–68 and the east rift eruptions within this interval with both observation of migrating centers of inflation determined from leveling surveys conducted before the 1967–68 eruption and with published models of expected deformation from different source geometries. We adopt a model of concatenated magmatic plugs with nodes beneath the inflation centers. Addition of erupted and intruded volumes of the three summit magma batches yields a liquid magma volume of about 0.2 km3, with dimensions of ~1 km by 1 km by 200 m centered at about 3-km depth within source 2. Following the Halemaʻumaʻu eruption of 1967–68, the chemistry of magma coming into Kīlauea’s summit reservoir has changed frequently, and during the eruption that began in 1983, chemical changes have been subtle and continuous. In this period we interpret changes in chemistry as related to an increase in magma supply resulting from increased partial melting in an expanding mantle source volume. We know from instrumental recording of eruptions since the long Halemaʻumaʻu eruption in 1952 that stress in the edifice accumulates as magma is added underground and is relieved by eruption and by dilation of the rift zones associated with seaward movement (spreading) of Kīlauea’s south flank. During and after the last half of the 20th century, magma transfer to the rift zone has dominantly occurred from source 2. High rates of flank motion have been correlated with high rates of endogenous growth; alternatively, lower rates of motion have characterized periods when the underground magmatic plumbing was being refilled following lateral removal of magma, as well as periods when a more open magmatic plumbing favored continuous eruption. Since at least 1952, source 3 has not drained during deflations, which was apparently not the case before 1924. Triangulation and leveling conducted in 1912, 1921, and 1926, combined with post-1912 tilt measurements, identified a broad regional uplift in 1918–19 and an equally broad collapse in 1924, neither of which has been seen since. We associate these elevation changes with addition or subtraction of magma from all three magma sources, dominantly source 3. We interpret the intrusion beneath the east rift zone during the 1924 collapse to have stabilized the rift zone-south flank relationship, preventing loss of magma from source 3 in subsequent collapses. Rates of seaward spreading were low until 1952, when earthquakes in 1950 and 1951 associated with surges of magma from the hotspot triggered a large offshore south flank earthquake swarm that unlocked the south flank and enabled a greatly increased rate of seaward spreading. Magma supply rates have been derived for the entire period of study. Between 1823 and 1840, magma was supplied from source 1 at a very high rate of more than 0.2 km3/yr, which we interpret as recovery from a substantial draining of magma from beneath Kīlauea in 1790. Inferred magma supply rates diminished to one-tenth of that value after 1840, in part because of increase in the activity of Mauna Loa beginning in 1843. Magma supply rates between 1918 and 1924 were about 0.024 km3/yr, matching that of the period from 1840 to 1894. During 1950–52 the magma supply rate increased to about 0.06 km3/yr, in part because of the great reduction in Mauna Loa activity following its large eruption in June 1950. Following the summit eruption of 1967–68, magma supply increased further to ~0.1 km3/yr, and further increases to more than 0.2 km3/yr occurred during the east rift eruption that began in 1983. Eruption at Kīlauea’s summit took place in 1952, and eruptive activity steadily increased as increased magma supply also drove increased spreading rates. The inability of magma supply to be accommodated by a combination of eruption and spreading during the 1969–74 Mauna Ulu period stressed Kīlauea’s south flank. The stress was relieved in part by the M7.2 earthquake of 29 November 1975. That earthquake, in turn, dilated Kīlauea’s east rift zone as the south flank moved seaward, producing a favorable condition for continuous east rift eruption, which began in 1983. The 1975 earthquake also resulted in the ability of the south flank to move independently under the influence of gravity, effectively decoupling the spreading rate from changes in the magma supply rate. The continuing increase in magma supply after 1983 was instead manifested in rift dilation, increased intrusion, and ultimately in the launching of a second eruption in Halemaʻumaʻu in March 2008, the first instance in Kīlauea’s recorded history of simultaneous eruption at the summit and on the east rift zone. Kīlauea’s history can be considered in cycles of equilibrium, crisis, and recovery. The approach of a crisis is driven by a magma supply rate that greatly exceeds the capacity of the plumbing to deliver magma to the surface. Crises can be anticipated by inflation measured at Kīlauea’s summit coupled with an increase in overall seismicity, particularly manifest by intrusion and eruption in the southwest sector of the volcano. Unfortunately the nature of the crisis—for example, large earthquake, new eruption, or edifice-changing intrusion—cannot be specified ahead of time. We conclude that Kīlauea’s cycles are controlled by nonlinear dynamics, which underscores the difficulty in predicting eruptions and earthquakes. 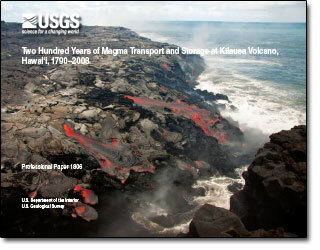 Wright, T.L., and Klein, F.W., 2014, Two hundred years of magma transport and storage at Kīlauea Volcano, Hawaiʻi, 1790–2008: U.S. Geological Survey Professional Paper 1806, 240 p., 9 appendixes, http://dx.doi.org/10.3133/pp1806.